Surrey-based Sam Bird made his name in Formula BMW in 2004 and 2005, and underlining his potential with fourth place in the British Formula Renault series in 2006, a season which included four wins. In 2007 he participated in the British Formula Three Championship, again finishing fourth this time with two wins. In the same year he was elected to the Motor Sports Association Race Elite Scheme and also did some testing work with the Williams F1 team. He raced for Manor Motorsport in the Formula Three Euroseries in 2008 but found it much tougher without any wins although he did manage three podiums, and a switch to Mücke Motorsport in 2009 did not produce any discernable improvement. In 2009-10 he raced in the GP2 Asia series for ART Grand Prix and did enough to be retained with it for the 2010 GP2 series. After more than his fair share of bad luck, he took his first win at the Monza feature race and finished fifth overall in the standings. For 2011 he made the switch to iSport International for both the Asia and European series and made an impressive start to sit joint top of the championship after the first four races. 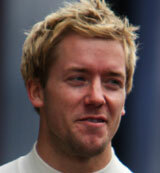 He eventually finished sixth as his commitments with the Mercedes team grew, and Bird drove for the team at the Young Driver Test for a second consecutive year. He switched to World Series by Renault in 2012, racing for I.S.R. to allow him to attend all grands prix required in his role with Mercedes.